It's that time of year again. A time to watch the ball drop, to be with family and friends, to start anew. This past year has been rather hectic for me. I went on my honeymoon, graduated from law school and preparing for the Bar Exam. I served as Junior Warden through Table Lodges and my first Grand Lodge communication. I memorized the long MC lecture for the second degree. In all, I have had a good year for me. The past year has also seen many firsts that I thought I would not see for a long time, a Democratic primary with two strong contenders that were not older white men, first a woman vice presidential candidate and the election of the first African-American president in this country's history, former Senator (and soon to be President) Barack Obama. We have seen economic booms and busts, where huge financial companies like Lehman Brothers and Bear Stearns failed. We saw the last feudal state dismantled. We saw one of the greatest performances in history as Michael Phelps earned eight gold medals at the Beijing Games and surpassed what was thought to be the impossible record set by Mark Spitz. We saw Heath Ledger, one of the great actors of our age, pass away at an incredibly young age while one of the greatest actors, Paul Newman, passed on without much fanfare. In the state of Minnesota, we still don't have a senator. We saw a new bridge rise from the tragedy that was the I-35W Bridge collapse. The following year promises to be just as crazy and unpredictable, especially for me. I will be serving as the Senior Warden of Corinthian Lodge while I work on my Bar prep. I will be looking for a job in the current market and although it is bleak, I think that I might get lucky in the job hunt. I am incredibly excited for what the new year will bring and I wish all of you and yours the very best. I have a special affinity towards the labor movement. My Father is a railroad engineer as was my Grandfather, while my Great Grandfather and my Great Great Grandfather were railroad workers. My Father and Grandfather are union members. My maternal Grandfather was a Local 49 crane operator who helped construct Interstate 35W. During my studies in law school, I took a special interest in employment law and labor law and the connections between them. As you can see, my life has been touched by labor from roots to leaf and I find its growth and development to be fascinating. I have always held the belief that the origin of Masonry did not lie in a supposed relation to the Templar Knights but were more likely related to the stonemasons’ guilds of Europe. These guild members were the builders of the great cathedrals of the era and represented the best craftsmen of their age. These guilds were the precursors of the modern labor movement and contain many of the same values unions express today, namely, brotherly love and relief. Through a series of essays, I will discuss many of the groups that rose out of the labor movement and their connections to Freemasonry. I decided on AOUW as the first group to discuss while I was visiting my in-laws in western Minnesota. The Ancient Order of United Workmen (A.O.U.W.) was a fraternal organization created by J.J. (John Jordan) Upchurch, a Freemason and railroad worker, in 1868. It was formed during the Golden Age of Fraternity in the United States during the period after the Civil War. Originally, the A.O.U.W. was designed using ritual similar to that used by Masonic lodges but went a step further by offering death benefits for a brother’s family. By introducing death benefits, the members of A.O.U.W. received an added bonus over and above the ritual and camaraderie that other fraternities offered at the time. The way a brother joined and received benefits was as follows: a brother of the A.O.U.W. would pay $1 to join the insurance policy. If the brother should happen to die while on the job, the heirs would receive $500 from the fund and the members of the local lodge would be assessed a $1 to replenish the fund. The insurance benefit offered by the A.O.U.W. was the first of its kind in the United States by a fraternal organization as there was no discretion by the members on who would receive the largesse of the lodge. The A.O.U.W. was built on the theory of working men needing protection for their families. At the time, there was little to no protection afforded to the working class, no unemployment benefits, no pensions or retirement plans and only employee-paid insurance plans (employer paid insurance plans did not arrive until 1911). It was the stated mission in the Preamble of A.O.U.W. : “(1) To embrace and give equal protection to all classes and kinds of labor, mental and physical; to strive earnestly to Improve the moral, intellectual, and social condition of Its members; to endeavor, by wholesome precepts, fraternal admonitions, and substantial aid, to Inspire a due appreciation of the stern realities and responsibilities of life. (2) To create a fund for the benefit of its members during sickness or other disability, and, in case of death, to pay stipulated sums to such persons as may be designated by each member; thus enabling him to guaranty his family against want." (quoted from the Nebraska Supreme Court case, Grand Lodge A.O.U.W. v. Brand, 46 N.W. 95)The seeds of the modern labor movement are obvious throughout this Preamble. The Minnesota connection to A.O.U.W. can be found in the laws passed by the State of Minnesota. The State of Minnesota allowed the incorporation of the A.O.U.W. in 1905 under H.F. No. 52 establishing the Grand Lodge and subordinate Lodges as well as the women’s auxiliary group, the Legion of Honor. When I saw the poster in Montevideo, I was at first confused how it got there. However, I have a theory. Montevideo was a hub for rail traffic as it was at the confluence of the Minnesota and Chippewa rivers. There still exists a restored Milwaukee Road depot in Montevideo that is maintained the Milwaukee Road Heritage Center. Therefore, I would assume that there was a Lodge based in Montevideo. I will be contacting the Chippewa County Historical Society regarding the connection the A.O.U.W. had with the city of Montevideo. This is only a short, cursory look at the A.O.U.W. and doing a full look at this group could fill a book especially in the matter of insurance law (a subject more esoteric than the origins of Freemasonry). I realize that there are some arguments for the connection between Freemasonry and the Knights Templar but I remain unconvinced. The connection between what is the modern union, trade or otherwise, and stonemasons’ guilds seem much more intimately interconnected with its focus on mutual aid. I would extend this connection of Guilds within Freemasonic history. I will continue to explore further the many different labor groups that have a connection with Freemasonry and the Golden Age of Fraternity. I just want to wish all of you a Merry Christmas. May you and yours have a wonderful day. It is truly a wonderful time of the year to be with family. Also, today is the fifth day of Hanukkah, so if you are celebrating this beautiful holiday of commemoration, may you have a wonderful day to be with family. I was reading the most issue of The California Mason and noticed a very interesting article. The theme of the magazine was food but I noticed a very different topic. The article featured not one but two lodges in California working the ritual in French. That’s right. The article, entitled Bon Appétit by Cason Lane, describes these two Lodges, La Parfaite Union Lodge #17 located in San Francisco and Vallee de France #329 located in Pasadena who do their ritual work. This fact piqued my curiosity. I visited the history section of Vallee de France’s and found that originally this Lodge was chartered by an obscure Louisiana Masonic body and then received another charter from the Grande Lodge Symbolique Ecossaise based in Paris. The Lodge was considered clandestine but sought recognition from the Grand Lodge of California which had absolute jurisdiction over conferring the first three degrees. Vallee de France Lodge finally surrendered its charter from Grande Lodge Symbolique Ecossaise and received a new charter from the Grand Lodge of California with a special dispensation to continue to work in French and to confer the first degree as it had always done. It is really amazing to think that there are Lodges in this country working the ritual in another language. This got me thinking, why don’t more Lodges work in other languages? Many new immigrant groups live and work in this country seeking the American dream. Although they may know basic words of English, they may not feel completely comfortable with speaking a new and unfamiliar language. Perhaps we, as Freemasons, should allow the creation of Lodges that use the mother tongue of these new immigrant groups. In my state, we have many new immigrant groups from many continents. They are Hmong, Somalis, Ethiopians, Liberians, Russian, Indian, Latin and South Americans as well as many others. I love living in Minnesota with the mixture of cultures, clothing and languages where there are many choices of food and activities originating from these cultures. However, I sometimes think that Freemasonry has a major hurdle for these groups, language. The ritual is in English. It is okay for me to be a Mason because English is my natural language. Why shouldn’t we extend this ability to understand the ritual to a worthy man who has another mother tongue other than English? In Minnesota, Norwegian immigrants maintained newspapers that were only in Norwegian until late last century, and created fraternities like the Sons of Norway to preserve their culture. In the Texas Hill Country, ethnic Germans lived in small isolated conclaves preserving their language for generations. Although these languages began to lose their mark on these population, they were still important to those first two generations. Masonry seeks to be the great tree of morality, we may have different branches but the trunk is the same for all of us. Perhaps allowing brothers to do the ritual in their own language will help to foster this understanding amongst our brothers and keep bonds within new immigrant groups. Now, here is your French lesson for today. Two stories have been recently published about living in a Masonic Lodge. Now, I love Masonry as much as the next brother but would I live in a Masonic Temple....hmm....maybe. Masonic buildings have long served our Craft, but an important question has rarely been asked: What is to be done with our buildings after we have left? I recently noticed in the Los Angeles Times a story about a Masonic Temple that has now been converted into loft apartments. At first, I was a little taken back. "Live in a Masonic Temple, why would anyone want to do that?" Long Beach Temple Lofts is a Masonic building that has been converted into a multiple living space. The building has been renovated in many places to resemble the building in its heyday during the 20's and 30's. Thankfully, both the developers of the Condominium and the Historical Society took a special interest in protecting the integrity of this beautiful building. In fact, the Lobby was preserved to the way it had looked during the 20's including the colors used. The owners of the building give their idea of transforming the building as "adaptive use". This is the idea that a building which once served one purpose will now serve a new purpose in a changing world. I am somewhat suspicious of this idea but if the building is saved, there is at least some hope. The second story comes out of Brazil, Indiana. This Masonic Temple was purchased by a college professor. The difference between his purchase and the transformation by the loft builders can be summed up by the words of the Professor Chambers, “I’m a Mason myself, [s]o, when I heard it was going up for auction, I wanted to make sure it went to good hands, and I hoped to do something else with it beyond living in it.” Brother Chambers states that he hopes to house galleries of art and be a studio for artists. I think that this is an auspicious event for this 101 year old Masonic building. A brother will keep and protect this building yet has also adapted the building to a new use. This is a very different idea of "adaptive use". I still lament losing our buildings like the Scottish Rite in Chicago and other places. However, when I see creative uses of buildings that were once ours, I am able to wipe those few tears away and smile. We may have left the building but our spirit will live on through preservation efforts and creative usages. The Grand Lodge of Michigan has initiated a wonderful website aimed at informing possible candidates seeking light. The website is incredibly easy to navigate and looks great. The website provides a great amount of information and an ability for the potential candidate to contact a local Lodge to petition. I am completely in favor of this kind of web presence. Grand Lodges, for many years, were fortunate enough to live in a pattern. Brothers would join because their father was a Mason or they knew a brother in the Service. Now, we have a new system in place. Brothers are joining knowing no one who is a member. With websites like this, we are able to communicate with these men. Another effect that this site has is that it gives Grand Lodges a good model to follow. We, as Masons, need to define our message. For years, our reputation has been defined by others, both for us and against us. We only carried the banner of the square and compass and expected those around us to know who we are. Now, we must define our message in clever new ways. 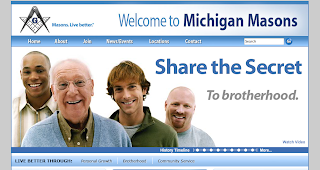 Michigan has an even better tagline than even 2B1ASK1, "Masons, Live Better". This is a good sign, but we need more. Grand Lodges need to realize that men are stretched for time. We need to show that being a Mason is worth the time put into it. This is a good start and I hope to see more in the future. If you know any man living in Michigan that is thinking about becoming a Mason, invite them to visit this site. I have decided to discuss the newest corner of Freemasonry and the Web, podcasting. For those out there that are not in the know, podcasts are radio shows available to download and can be listened to on one's computer, mp3 player or iPod. 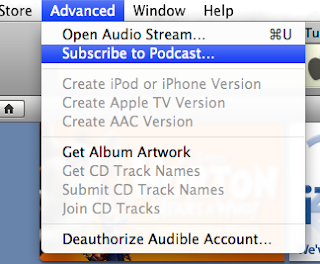 Podcast topics can range anywhere from NPR to the Onion to just crazy stuff. There are three great shows about Freemasonry that I think are great. The first show is Masonic Central. As I mentioned before, Masonic Central is a weekly podcast by my friends Dean Kennedy and Greg Stewart. This podcast interviews some of the movers and shakers of the Masonic world. Also, the show is taped live allowing questions to be asked in real time for the guests. I really enjoy this show and look forward to it every week. By the way, on December 20th, Brother Dean and Brother Greg will attempt a live Table Lodge. It should be a fun event. The second show I would like to discuss is X-Oriente. X-Oriente is a show hosted and produced by Eric Diamond. This show was my first foray into "E-Masonry" and really got me interested in blogging. Brother Diamond produces a fantastic show about many topics within Freemasonry, religion, West Virginia, etc. I really enjoy this show and now that Brother Diamond has spent his time in the East, he has stated that he will produce more shows. The final podcast I would like to discuss is the podcast produced by the Grand Lodge of Ohio. A Grand Lodge producing a podcast is essential to keeping Freemasonry going. As men entering Freemasonry are younger than before, they will be expecting their Lodges and their Grand Lodge to be web-savvy. The fact that Ohio has taken it upon itself to enter this world is auspicious for the continuation of the Craft. Check out all of these shows especially if you are interested in recent news about Freemasonry. JustaMason, who writes the great Just a Mason blog, reminded me of the fourth podcast that I was going to write about, the Digital Freemason. If you want a detailed description, read Justa's comments. Silence Dogood at The Middle Chamber blog asked me to give my thoughts concerning what the Craft can do to sustain itself into the future. If you haven't read The Middle Chamber, you really should. Silence Dogood has many insightful articles and he shows his dedication to the Fraternity with every word he writes. If you want to read my article, click here. I was looking through the winter 2008 issue of The California Mason and found some very interesting articles on the Entered Apprentice. In fact, most of the focus of this issue looked at the Entered Apprentice and its importance in Masonry. One of the articles that caught my attention concerned how men are engaged at the 1st step in their Masonic journey. “A Record Year” by Terry Mendez looks into what California is doing for the newest brothers of the Fraternity. According to Brother Mendez, 1,951 Entered Apprentices were initiated in the state of California last year; this is the greatest number initiated in 20 years. The article presents a great list of ideas that successful Lodges are implementing to help introduce new brothers into the Craft. A few ideas struck me in this article. One of them was having the new brother mentored by a brother his age. This plan is interesting in its simplicity and its possible effectiveness. According to the article, Huntington Beach Lodge #380 has begun this fascinating mentoring model. Additionally, a brother is assigned as a mentor even before the petition is submitted. I find this to be an intriguing case of mentoring from start to finish. Many brothers entering Freemasonry today have less of a connection than those chosen previously. Instead of stories of fathers bringing in sons or friends bringing in friends, it is common that a brother learns about his connection to Freemasonry from a grandfather, an uncle or learns about the Craft from a book. Mentoring is essential to assist these guys in being acclimated to Lodge life and to learn what to expect and what is expected of them. As I have written before, I have recently commenced a mentorship program whereby the newest Master Mason helps the newest Entered Apprentice. In this way, the newest Master Mason may not possess the greatest amount of Masonic knowledge but he does have a similar excitement as the candidate. Also, the youngest Master Mason is in the best position to appreciate a new brother is experiencing during the process. Another great practice initiated by Temecula Catalina Island Lodge #524 is to have a brother do pre-application interview with a petitioner accompanied by his spouse so the applicant and his spouse receives a family-oriented awareness of the Fraternity. I am sure that this procedure can also be done with significant others as well but it is important that both the brother and his significant other understand what Freemasonry is and how it will affect both of them. In fact, I think a major change in Freemasonry is the number of family-oriented activities that are done within a Lodge, including open installations, picnics, holiday get-togethers and so forth.